When national security is involved, we suggest you buy a new computer, a USB key and pay cash. In any case you must then find a busy coworking place or cyber cafe you don’t regularly go to and sit at a place with your back to a wall to avoid cameras capturing information on your screen or keystrokes. Each SecureDrop instance has a publicly available Source Interface: a website where sources can create anonymous accounts, submit files and messages, and check back for replies. Each Source Interface is only available as a Tor Hidden Service, which is a special type of website with an address ending in “.onion” that is only accessible through Tor. Tor is an anonymizing network that makes it difficult for anybody observing the network to associate a user’s identity (e.g. their computer’s IP address) with their activity (e.g. uploading information to SecureDrop). The easiest and most secure way to use Tor is to download the Tor Browser from the Tor Project website. 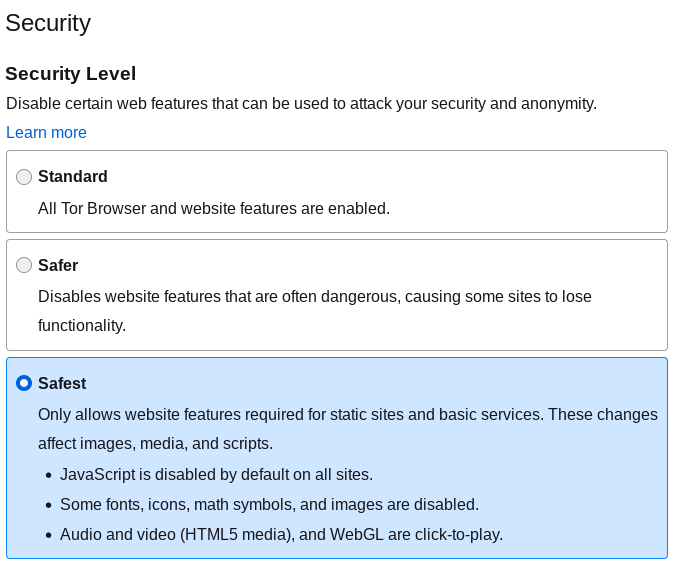 The Tor Browser is a modified version of the Firefox web browser designed to protect your security and anonymity while using Tor. If there is a chance that downloading the Tor Browser raises suspicion, you have a few alternatives. Once you have the Tor Browser, launch it and enter the “.onion” address for the Source Interface of the organization that you wish to submit to. You can find this address on the organization’s Landing Page, or listed on the SecureDrop Directory. While using the Tor Browser on your personal computer helps hide your activity on the network, it leaves traces (of its own installation) on your local machine. For even more deniability, we recommend booting into a live system such as Tails for a higher level of security. Tails is specifically designed to run on your computer without leaving traces of your activity, and automatically routes all of your Internet browsing through Tor so you can easily access SecureDrop safely. Each SecureDrop instance is totally independent, and submissions to that instance are only available to journalists associated with that organization. All organizations have a Landing Page that provides their own organization-specific recommendations for using SecureDrop. We encourage you to consider an organization’s Landing Page before submitting to them. Most organizations make their Landing Page prominently accessible from their main website’s homepage. You can also find an incomplete list of organizations accepting submissions through SecureDrop on the SecureDrop Directory maintained by Freedom of the Press Foundation. Open the Tor Browser and navigate to the .onion address for the SecureDrop Source Interface you wish to make a submission to. The page should look similar to the screenshot below, although it will probably have a logo specific to the organization you are submitting to. The page should look similar to the screenshot below. If this is the first time you are using SecureDrop, click the Submit Documents button. You should now see a screen that shows the unique codename that SecureDrop has generated for you. Note that your codename will not be the same as the codename shown in the image below. It is extremely important that you both remember this code and keep it secret. After submitting documents, you will need to provide this code to log back in and check for responses. The best way to protect your codename is to memorize it. If you cannot memorize it right away, we recommend writing it down and keeping it in a safe place at first, and gradually working to memorize it over time. Once you have memorized it, you should destroy the written copy. For detailed recommendations on best practices for managing your passphrase, check out Passphrase Best Practices. Once you have generated a codename and put it somewhere safe, click Continue. 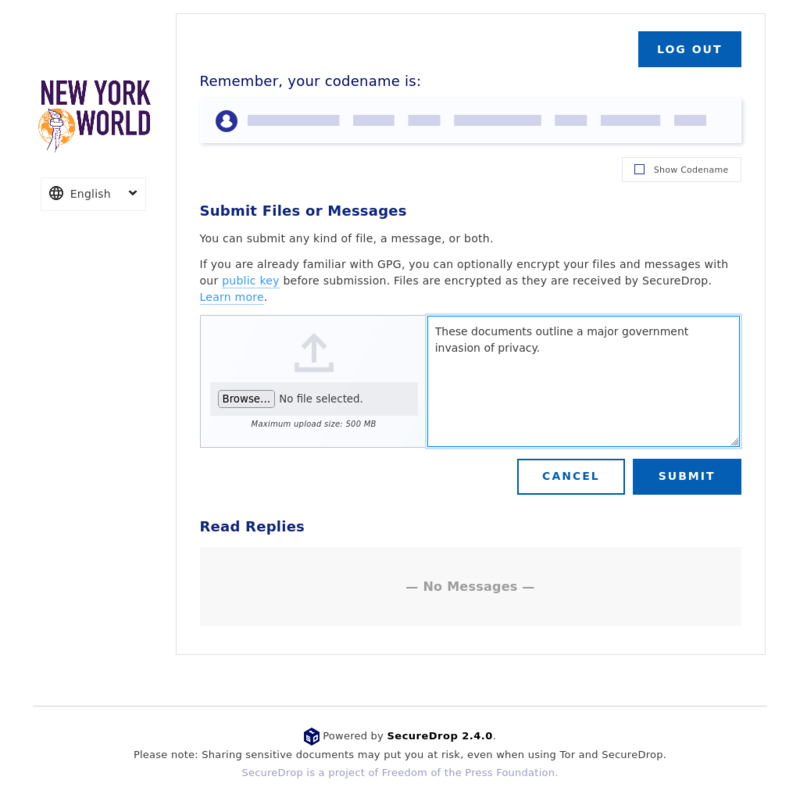 You will next be brought to the submission interface, where you may upload a document, enter a message to send to journalists, or both. You can only submit one document at a time, so you may want to combine several files into a zip archive if necessary. The maximum submission size is currently 500MB. If the files you wish to upload are over that limit, we recommend that you send a message to the journalist explaining this, so that they can set up another method for transferring the documents. When your submission is ready, click Submit. 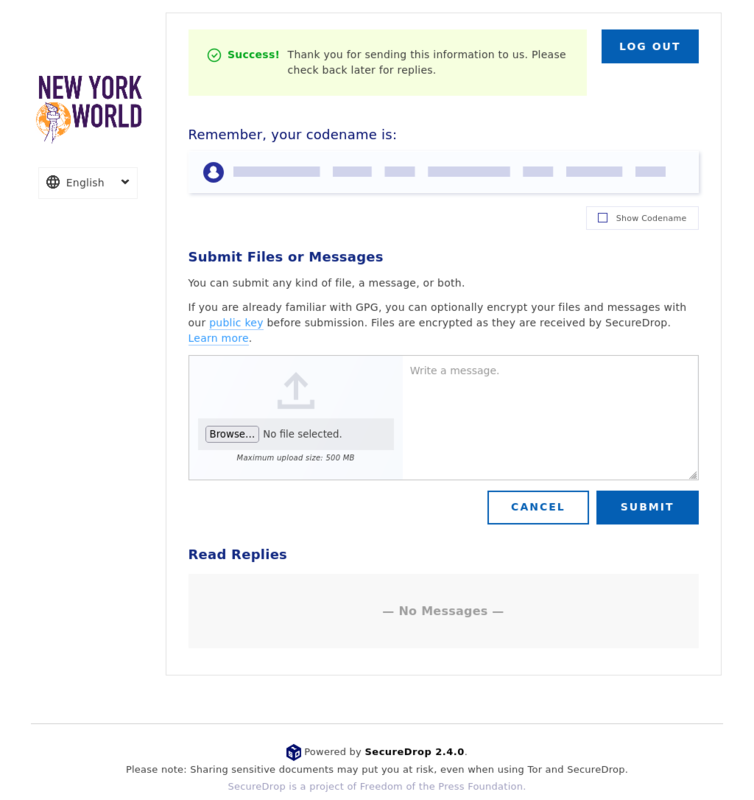 After clicking Submit, a confirmation page should appear, showing that your message and/or documents have been sent successfully. On this page you can make another submission or view responses to your previous messages. 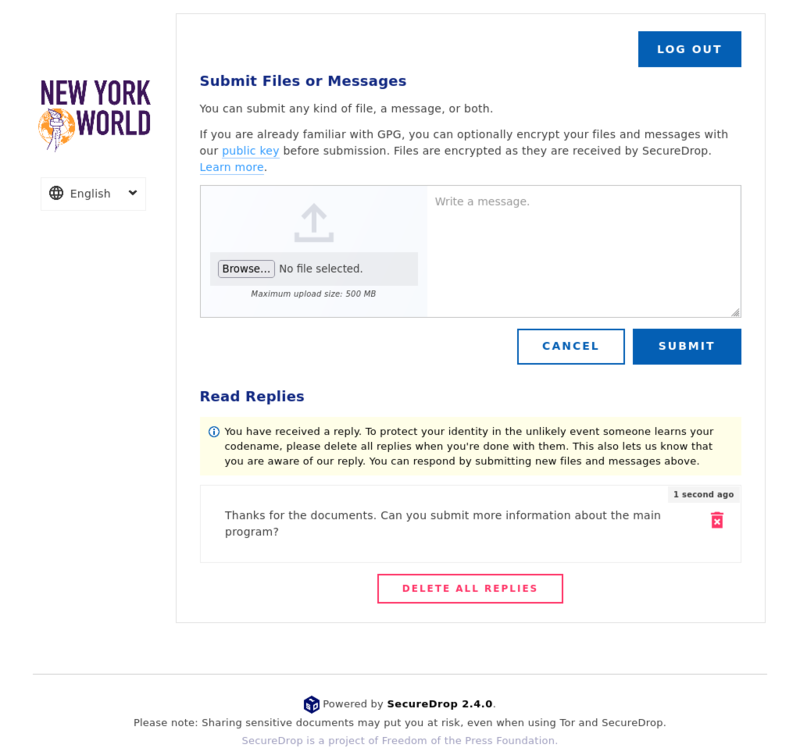 If you have already submitted a document and would like to check for responses, click the Check for a Response button on the media organization’s SecureDrop homepage. The next page will ask for your secret codename. Enter it and click Continue. If a journalist has responded, their message will appear on the next page. 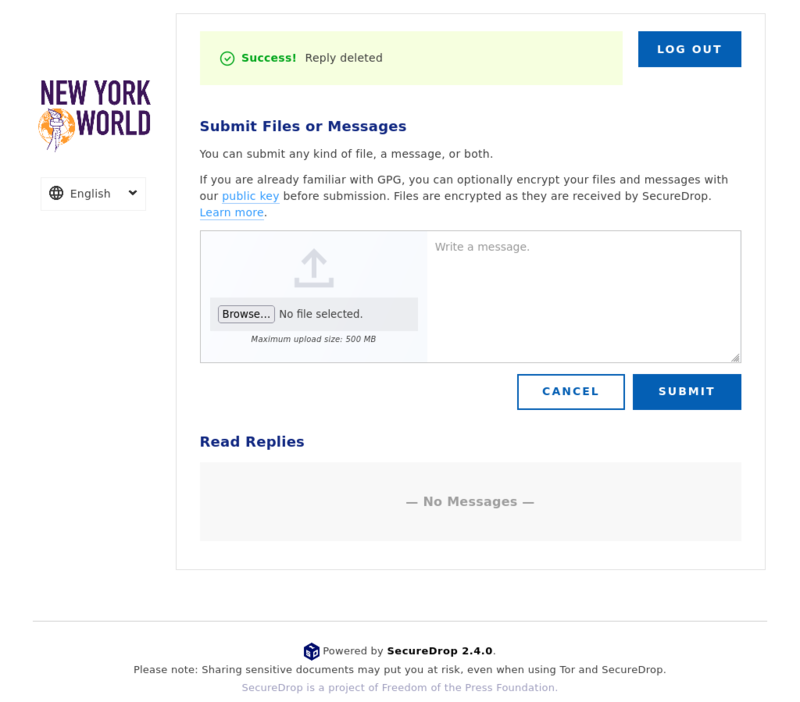 This page also allows you to upload another document or send another message to the journalist. Before leaving the page, you should delete any replies. In the unlikely event that someone learns your codename, this will keep your identity secret as no one will be able to see the previous correspondences you had with journalists. After you delete the message from the journalist, make sure you see the below message. If the server experiences a large number of new sources signing up at once and is overloaded with submissions, the journalist will flag your message on their end and you will see the message below. They can’t write a reply to you until you’ve seen this message for security reasons. This will only happen the first time a journalist replies and with subsequent replies you will skip this step. Click Refresh or log in again to see if a journalist has responded. Repeat these steps to continue communicating with the journalist. © Copyright 2017, Freedom of the Press Foundation Revision 7765fde1.